I wasn’t sure what to expect of Tautou. Interviewers often identify her with her most famous character, quirky-cute Amélie – ‘she giggles adorably,’ wrote one journalist (male, obviously). But I’ve heard she can be prickly. The truth, it turns out, is that she’s shy: someone who’s never been comfortable in the limelight. We’re here to talk about her new film, an adaptation of the 1927 French novel ‘Thérèse Desqueyroux’ by François Mauriac. 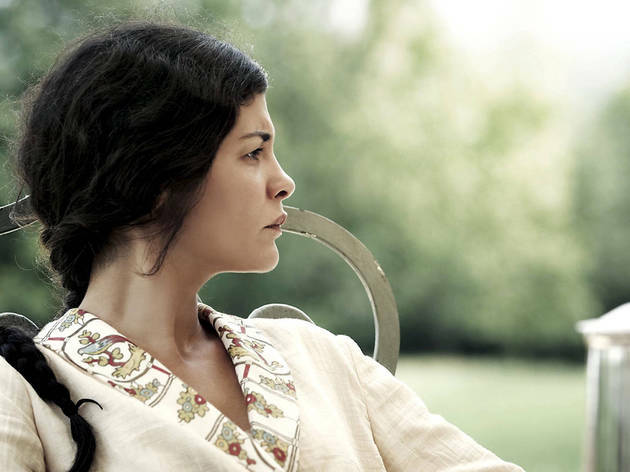 Tautou’s Thérèse, a young wife in the late 1920s who poisons her boring husband with arsenic (trust me, you’re on her side). ‘I wanted to go to the darker side of behaviour,’ she smiles. How did she cope? Tautou shrugs. ‘You learn how to be invisible.’ She doesn’t dress like a star. Make-up free and wearing a crumpled red-and-white checked shirt, jeans and tasselly loafers, she pulls off that Frenchwoman thing of looking boyish and insanely gorgeous at the same time. In the past decade she has chosen her films carefully – playing Coco Chanel in ‘Coco Before Chanel’ and a woman convinced her missing fiancé is alive in the WWI drama ‘A Very Long Engagement’ from ‘Amélie’ director Jean-Pierre Jeunet. ‘I wanted to follow my own path. None of my choices made me more famous.’ I mention ‘The Da Vinci Code’. She’s too discreet to dish the dirt but says that she knew straight away that Los Angeles wasn’t for her. She also writes. What is she working on? A script? ‘No. It’s not for cinema. It’s an object. I hope it’s going to look like a book.’ A novel? ‘Kind of, yes.’ She scrunches her face with embarrassment. I hope her book takes a satirical bite out of Hollywood, but I doubt it. She says she lived for years in fear of being judged herself. ‘But I realise it’s important to live life for yourself. And not be scared about what people think.’ She says that what attracted her to the script of ‘Thérèse Desqueyroux’, the last film by director Claude Miller, who died last year, was its sensitive portrayal of a ‘trapped’ woman. Thérèse is too clever, too brooding to be a dull rich man’s trophy wife in rural France. 'Thérèse Desqueyroux' opens in the UK on Fri Jun 7. There’s something almost annoyingly tasteful about this adaptation of the 1927 French novel by François Mauriac. Tautou gives a self-possessed, complex performance as Thérèse – we sense a dam-burst of rage and boredom behind her mask. Otherwise, Claude Miller’s final film (he died shortly after making it) is a tad on the stiff side.